Two teams of mercenaries fight for control of a single console in the center of the battlefield. The console controls four NULL cannons and neither MCC can withstand a concentrated barrage for long, so capturing and holding the console is vital for both teams. The battle continues until one of the MCCs is destroyed or until one side depletes the otherGÇÖs clone supply. That's a lot of turrets. That's 1100 WP for my LAV gunner, should be fun. I foresee many matches decided by clone depletion if one team doesn't beat the other and make an initial hack. It will be a huge meat grinder. Logis may not have a chance to res anyone before being cut down themselves. Blaster tanks might be needed to shield hackers long enough to take the point away from an enemy, but they are likely to be sacrificial. 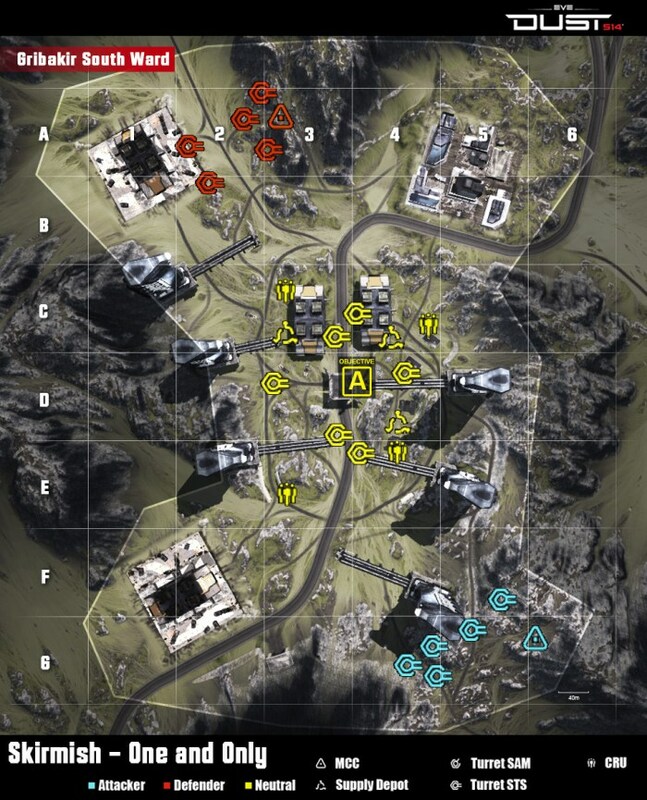 looks like the new "A" is where the old "C" was 5 months back when this was a 3 point map... I've already got like three ways i want to see this map be fought. glad to see im not the only one drooling over this one will really put my skills to the test...though, i imaging lots of ARs, heavies, and mass drivers. Edit, and possibly snipers lookin for easy kills. Did they get rid of the red lines for these matches? so we could actually go to the enemy base? Remote explosives, mass drivers, nova knives (cuz they're quite). This map could get crazy, looking forward to playing it. Edit: they should have put the objective point on top of the table top...make it kinda like king of the hill/mountain....whatever its called. Epic table top matches. This is gonna get wild. I love the new map concepts! Make a kit for running fast with additional hacking ability to get the A objective, then have teammates spawn on it? How about disabling the ability to spawn at A.
Obective A has not one, but FOUR null cannons? At least this will give players the incentive to defend the objective instead of hacking then running away. The one objective map looks most promising! What a crazy amount of turret fest, gunners will be most happy with this map. Plus I love the attacker/defender base layout. It's good to have definable permanent bases. Calling it, defending side is gonna dominate this map, those buildings are gonna be prime spots to pick of hackers and rain down mass drivers, not only that but uplinks on top and it will be one sided quick. After the first match on this map, which was an instant redline, I'm already annoyed by the fact that all the stuff drop throughout the match instead of being there from the start. We grabbed A right of the bat and redlined them instantly because they couldn't grab any CRU at the beginning, and it's a LONG way from the spawn to the objective. Also, remove spawning on objectives. It'll ruin this map I'm afraid, and it doesn't make any sense anyway. This excites me...lets see how it plays. My experience was similar. Instant red-line and no comeback after that. Maps should be considerably smaller for this game-mode. I'm talking about a quarter of the area they are now. YES - it will be WAR - focused WAR - Lol!!! Is it me or are all the good ( as in you have to look a bit to find them and there's some cover) sniperspots removed (not only in this map but everyone of the new versions)??? Except the starting points there aren't any left. Scout's are out except for a blitzrun at the start (almost no armor) . Not even sure if it would be faster / better to just take the 4x4 so you could use the heavies and imediately have some stronger defence. Think the logistics/triage peepz are going to earn their pay this time. Most stupid game map ever. Played it once will never do so again. FAVORITE new mode variant. Really fun. Only problem is the objective is not very visible, and took me a while to find where it actually is. This variation is definitely a keeper.